How do I Use the Nutrition Facts? 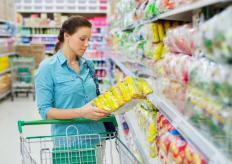 Carefully reading the nutrition facts on food packaging can help people stay informed about the foods they eat. In many countries, food manufacturers and retailers are obligated to ensure that certain nutrition facts are available. These can be found on food packages, menus, or nutritional information sheets. Although you have access to this information you may be wondering what you should do with it. First, you can use it to assess your diet and to achieve or set dietary goals. Second, you can use it to adhere to dietary restrictions that may have an impact on your health. People are growing increasingly health conscious in hopes of living longer and healthier. If you have not given this much thought, you may want to start. Health authorities generally claim that a person’s diet has a profound impact on her life. Knowing this and living in a society where availability of nutrition facts is widespread makes it much easier for you assess your diet and have a positive impact on your health. You have probably heard that there are some nutrients, such as iron and calcium, which you should try to eat sufficient amounts of daily. You have probably heard that some nutrients, such as cholesterol and saturated fat, are only advisable in much smaller daily quantities. You can use nutrition facts to determine how much of these nutrients you are taking in daily. If you take in more or less of certain nutrients than you need, your habit of assessing nutrition labels will help you easily determine which foods you should consume more of and which you foods you need to limit. From this point, you can begin to set dietary goals that may have an impact on things in your life such as weight, energy levels, and blood pressure. If you already have dietary goals, nutrition facts are a primary tool for helping you achieve them. You may even find it necessary or beneficial to maintain a daily nutrition log. If your physician has informed you of health problems that will require you to change your diet, nutrition facts will prove a useful tool. People who suffer from diabetes, for example, are generally restricted to small amounts of carbohydrates. Fortunately, carbohydrate content is one of the nutritional facts commonly provided on foods. Many items that people assume do not have certain nutrients actually have a large amount. Likewise, you may be shocked to learn that you are gaining nutrients from foods you never suspected had them. If you have children, nutrition facts can also help you teach them about nutrition and healthy eating. You can use this information to show your children how to plan meals. You can also use this information to help them assess when they are overindulging in nutrients such as sugar and salt so you do not always have to. What is the Difference Between Nutrition and Nutrients? What is a Nutrition Log? How do I Choose the Best Nutrition Classes? What is a Nutrition Table?